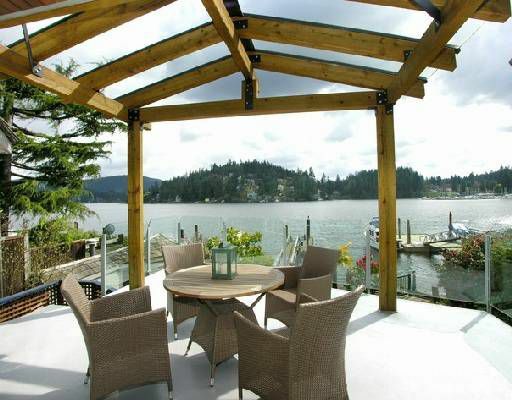 Creativity and elegance define this luxury waterfront residence situated in Deep Cove, BC. This is an amazing 4977 sq ft custom built enclave for both family living and glorious entertaining. A unique 8460 sq ft ocean front property with incomparable teak railed deep water moorage dock. Stunning terraced deck and patios overlook the crystal pool and gazebo covered outdoor spa. This heaven offers a sunken living room, formal dining room, new gourmet kitchen with cherry cabinets, granite countertops and top of the line stainless appliances. The Master Retreat features a gas fireplace, huge ensuite with a separate sauna and quaint balcony for lazy morning coffees. Spacious media room for entertaining and watching movies. You will not want to leave this resort you can call home...!